Monday, August 23, 2010: NEW SONG ONLINE! HAIL OF BULLETS launch first song of upcoming new album ‘On Divine Winds’ exclusively on MySpace! Dutch Death Metal Masters HAIL OF BULLETS have launched the first song of their upcoming new album ‘On Divine Winds’ exclusively on MySpace. Surf to the bands sitehttp://www.myspace.com/hailoffuckenbullets to check out the album opener Operation Z!Drummer Ed Warby comments on Operation Z: “On December 7th of 1941 Japan launched Operation Z, a bold surprise attack on the United States which came as such a shock that Roosevelt referred to it as “a date which will live in infamy”. It is no coincidence then that we chose to cover this event in the crushing opening track of our upcoming album “On Divine Winds”. Experience the carnage as hundreds of planes descend from the sky to bring death and destruction, and revel in the aural massacre we unleash upon your ears and necks! Banzai! The album title ‘On Divine Winds’ refers to the translation for the Japanese word Kamikaze, as kami stands for “God” and kaze means “wind”. ‘On Divine Winds’ was produced by Ed Warby and like before the monstrous mix was in the capable hands of Mr Dan Swanö. ‘On Divine Winds’ features 12 tracks on the limited first Digibook edtion and 11 tracks on the regular jewelcase version. The album will be released October 8/11 via Metal Blade Records in Europe as a limited Digibook (including a bonus track and a bonus-DVD) and as a limited gatefold 2-LP! August 2010 – HAIL OF BULLETS has set “On Divine Winds” as the title of its second full-length album, due in North America on October 12 via Metal Blade Records (one day earlier internationally). The group recorded 11 songs plus an intro for the CD, which, like its predecessor, was produced by Ed Warby was mixed by Swedish producer/multi-instrumentalist Dan Swanö (EDGE OF SANITY, BLOODBATH, NIGHTINGALE). The limited-edition version of the album will be made available as a digibook, including a bonus DVD. Comments Warby: “I don’t think I’ve ever worked this hard on anything in my entire life, but it sure has paid off! 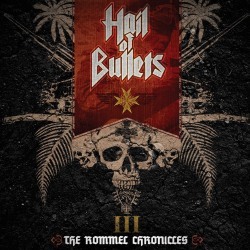 HAIL OF BULLETS’ debut album “…Of Frost And War” was a concept album about the Eastern front war of Germany. “On Divine Winds” is another concept effort, this time covering the Pacific battles between Japan and the USA. “On Divine Winds” will feature 12 tracks on the limited first digibook edition and 11 song on the regular jewelcase version. The new Hail of Bullets MCD ‘Warsaw Rising’ is now available through our webshop (click ‘merchandise’ button in left menu). Please allow 3-4 weeks for delivery during the holiday season! Hail of Bullets’ ‘Warsaw Rising’ mini-CD will be released through Metal Blade Records on July 17th 2009 and will only be available through several mail orders and the band’s own webshop. Please note that it’s a strictly limited edition of 2,000 copies. HAIL OF BULLETS to release new mini-CD in the summer! Dutch Death Metallers HAIL OF BULLETS go to war again with ‘Warsaw Rising’, an EP featuring two brand new tracks, one cover and three live recordings! The new songs are ‘Liberators’, a rumbling ode to one of the most magnificent bombers ever built and the title track which tells the tragic tale of the bloody 1944 Warsaw uprising. A massive cover of the Twisted Sister classic ‘Destroyer’ and 3 tracks from the Bullets’ earth-shattering performance at last year’s Party.San Open Air complete the searing sextet! HAIL OF BULLETS have now joined forces with TMR Music Promotions (Benelux bookings) and Bajvan Agency (Europe + rest of the world). Feel free to contact them at bookings@hailofbullets.com for future shows. We have received a VERY limited number of ‘Nachthexen’ shirts from Relapse Records. These shirts were available only through Relapse’s mail order, but now a select number of (European) fans can order these shirts directly from us. If you want one, please be quick cause we only received a very limited number…especially of the M-sized and XXL-sized shirts. Hail OF Bullets Forum online! We’d also like to thank everyone (fans AND press) for the overwhelming response to our debut album and the great crowd reactions at all the shows we’ve done so far! HAIL OF BULLETS’ debut album “…Of Frost And War” ” was released by Metal Blade on May 13th 2008 (NL/B/USA), May 16th (G/A/CH/I), May 19th (rest of Europe). The album was recorded in February/March of 2008 at Excess Studios in Rotterdam, Holland and mixed and mastered in Sweden by Dan Swanö of Edge Of Sanity fame. “…Of Frost And War” will be available as a limited first edition Digipak CD including bonus track and special pop-up packaging. After this first edition is sold out there will only be a regular jewelcase edition without the bonus track available, so be quick! The album will be released on vinyl, too! Click HERE for high resolution front art! “…Of Frost And War” will be released on the 16th of May (D/A/CH/I) / 19th of May (rest of Europe)! HAIL OF BULLETS are looking forward to play selected summer festivals in 2008! After 3 weeks of hard labour we finished the recordings of our debut album in the Excess studios in Rotterdam, Holland. Right now, Dan Swanö is mixing the album in the Unisound Studio in Örebrö, Sweden and it’s turning into one hell of a Death Metal monster. Expect over 50 minutes of molten metal mayhem at the end of May! Check ourMySpace page and YouTube page. Gigs page updated: check it out. Hail of Bullets will be playing the Summer Breeze Festival in Germany, which will be held from August 13th-16th 2008 in Dinkelsbühl! It’s not sure yet which date and which stage we’ll be playing. We hope to add some more festival dates in the coming weeks! Promo CD on vinyl !!! Iron Pegasus records from Germany (www.iron-pegasus.com) will be releasing our semi-legendary Promo CD on vinyl in January 2008! The 12″EP will be limited to 1,000 copies and there will be 2 different versions available (coloured and black vinyl). HAIL OF BULLETS to release “…Of Frost And War”! Dutch Death Metal sensation HAIL OF BULLETS have finished recordings for their debut album “…Of Frost And War”. The album was recorded in February/March of 2008 at Excess Studios in Rotterdam, Holland and mixed and mastered in Sweden by Dan Swanö of Edge Of Sanity fame. Expect over 50 minutes of molten metal mayhem at the end of May!